Anyway, Allen runs SpyGuy.com which is an ecommerce store that sells spy equipment online. His store has been featured in Forbes, Entrepreneur, CNBC, Fast Company and he was recently featured on the Tim Ferriss podcast as well. What’s cool is that he bootstrapped his company from the ground up and turned it into a solid 7 figure business. Steve: You’re listening to the My Wife Quit Her Job Podcast, the place where I bring on successful bootstrapped business owners and delve deep into what strategies they use to grow their businesses. Today I have my friend Allen Walton on the show, and we actually recorded this interview a while ago. But in the past couple of months, he’s been featured on the Tim Ferriss podcast and the Tropical MBA podcast as well and he’s got an amazing story that I know you’ll enjoy. But before we begin, I want to give a quick shout out to Klaviyo who is a sponsor of the show. Klaviyo is the tool that I use to build real quality customer relationships with my e-commerce store. And because all my transactions and email correspondence is tracked in Klaviyo, I can easily build meaningful customer relationships by listening, understanding, and taking cues from my customers and deliver personalized marketing messages. So for example, with one click of a button, I can easily send a specific and targeted email to all customers with a lifetime value of over $100 who purchased red handkerchiefs in the past year. And it is for this reason why over 10,000 brands have switched over to Klaviyo. Right now they have this cool docu series called Beyond Black Friday where they discuss successful marketing strategies that their customers are using that you can emulate with your business. So, if you’re interested in watching this series, head on over to Klaviyo.com/beyondbf, once again that’s K-L-A-V-I-Y-O.com/beyondbf . I also want to give a shout out to Privy who is also a sponsor of the show. Privy is the tool that I use to build my email list for both my blog and my online store. Now what does Privy do? Well, Privy is an email list growth platform and they manage all of my email capture forms. And I use Privy hand-in-hand with my email marketing provider. Right now I’m using Privy to display a cool wheel of fortune pop up. Basically a user gives their email for a chance to win valuable prices in our store. And customers love the gamification aspect of this. And when I implemented this form email signups increased by 131%. I’m also using their new cart saver pop up feature to recover abandoned carts as well. And bottom line, Privy allows me to turn visitors into email subscribers, which I then feed to my email provider to close the sale. So head on over to Privy.com/Steve and try it for free. And if you decide you need some of the more advanced features, use coupon code MWQHJ for 15% off. Once again, that’s P-R-I-V-Y.com/Steve. Now onto the show. Steve: Welcome to the My Wife Quit Her Job Podcast. Today I’m thrilled to have Allen Walton on the show. Now, Allen is actually someone who I met at Ecommerce Fuel Live a long, long time ago, but we actually didn’t really get a chance to know each other until we hung out at Billy Murphy’s Mancation earlier this year. 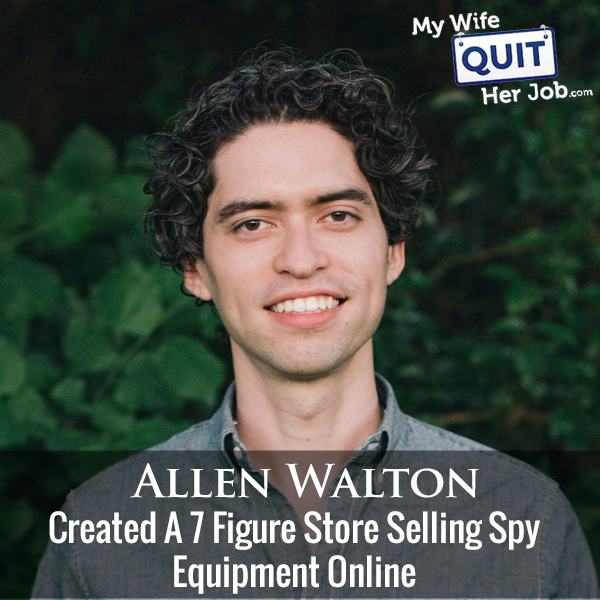 Anyway, Allen runs SpyGuy.com, which is an e-commerce store that sells spy equipment online, and his store has been featured in Forbes, Entrepreneur, CNBC, Fastcompany, and he’s actually recently on the Tropical MBA podcast. Anyway, Allen bootstrapped his company from the ground up and turned it into a solid seven figure business. And with that, welcome the show, how are you doing today Allen? Allen: Hey I’m doing well, thanks for having me. Allen: Now, we do get customers that – sorry to interrupt you but we do to get customers that get really frustrated with us when they see retargeting ad because they’re really concerned about somebody on their computer that sees an ad for Spy Guy, they get really upset. Even if we just email an order confirmation, they get infuriated. Steve: Just curious though, I actually didn’t end up getting any ads so my my worries weren’t real but are you running retargeting ads on Facebook? Allen: Not right this second we aren’t, but we’ve been kind of testing it over like the last month or so just to see if we can make it profitable because it’s actually been kind of difficult. Steve: Okay. And we’ll get into that a little bit because we did chat about it earlier. So Allen, before we get started with the guts of the interview, why spy equipment? And how did you actually get into this business? It seems a little random to me. Allen: Yeah. It’s super random, actually. So I live in Dallas, have my whole life. And when I was growing up, there was this spy shop here in Dallas that was called Spy Supply. It’s no longer in business but I used to go there with my family, like on Sunday afternoons or whatever after church. We’d go to the pancake house that was next door and I’d always be really curious about the spy shop that looked sketchy as hell. So wait, am I fast, is that okay? Allen: Okay. So it’s a really sketchy looking spy shop. I didn’t want to go in, I just kind of like wanted pear in through the windows. And so grew up still eating at that pancake house that was next door, and one day they had a help wanted sign out front. At the time I was like 21 years old, I was living at home, my parents really wanted me to get a job. And so my mom made me apply. It’s really kind of that, but I applied for the job and I ended up getting it. And so that’s kind of how I got into it. So selling CCTV systems to like big businesses and people with homes that wanted security cameras, but they also did sell a lot of spy related gear, so like hidden cameras, GPS trackers and whatnot. And they worked with like police departments and private investigators and plus it was kind of like a novelty store, so sometimes we’d get celebrities that came in and just want to poke around so that was always really fun. And that’s how I got started I guess. Steve: Why is it such a covert industry? Allen: I don’t know. It’s very frustrating. There’s no brand names on any of the products that we really sell. You can’t get any of these items in big box retailers or anything like that. You pretty much have to get them all online. Or if you live in a big city, there might be a small small spy shopp or security store in your town, but there’s no mass manufacturing going on. The big brands that are out there probably don’t want to have their brand name on a hidden camera, might just ruin their brand image kind of. Yeah, and possible a lot of the people that get in this industry, they’re just sketchy people as well. So like it’s sketchy industry run by sketchy people selling sketchy products and a lot of paranoid people going on. So yeah. Steve: Wait, so these items don’t have brands, so how does it work? How do you source your products? Allen: So when I started, working in that brick and mortar spy shop, that’s why I learned where they were getting some of the items from. A lot of it is coming from Asia, obviously and then there’s US distributors, so that’s how I started. The brand though, how do you even look it up? Steve: Like if someone wanted to get into this, it’d be difficult, right? Allen: It would be really difficult. I mean, you can see some — if you go to Alibaba or whatever, and you type in some keywords, then you can find some of the products that are on there. But the thing is there’s a lot of factories in China that are all making the same stuff. It’s like they’re using a public mold or something like that, or maybe it’s just a bunch of trading companies that are sourcing it from some factory that I can’t find on my own. So, it’s just very confusing. And I’ve made the trip over there trying to figure it all out, contacted as many people as I can. It’s just really bizarre. Like, you have no idea who’s the actual brains behind making some of these items, who’s the actual factory that’s making it, it’s really odd. Steve: Interesting. So do you actually carry inventory of your products then or do you drop ship them? Allen: Yeah, we carry inventory on all of the items that we sell. Sometimes we are running low or just completely out, then we can talk to the supplier that we’re getting stuff from into drop shipping it for us. If it’s an item that’s made in the US, if it’s an item that’s been made here, we just make sure that we have it in stock at all times. Steve: So what do you think that — you mentioned they don’t have brands, so are you allowed towhite label these? Like, can you slap your own brand on these items or no? Allen: Yeah, people do it all the time. If you go to Amazon or you just look around the spy shops that are online it’s pretty much all white labeled. Most people just keep it in the same crappy gift box or whatever that the Chinese supplier is giving them. They don’t even bother changing out the instruction manual. But yeah, if you look at Amazon, you’ll see the same item that’s being sold — excuse me, you’ll see the same item being sold by like 20 different suppliers under 20 different names. They’re all terrible brand names. It’s like somebody just did alphabet soup or whatever and just threw it on the Amazon product title. So yeah, it’s just very odd. Steve: Interesting. So you carry your own inventory, so how do how much to carry and what to carry? Because you have a lot of products in your site, I was just shopping on there the other day? Allen: Yeah, experience I guess. So, I’ve been doing this for almost a decade now, about five years on my own I suppose. So, just kind of seeing what customers are drawn to, what works, what gets returned often. So like, I actually take a lot of pride in our product selection on the website because we only carry the items that customers actually really like and items that we like and are low stress and don’t require a ton of tech support. We just want to avoid all of the headaches of dealing with returns and customers who are happy and saying that stuff about us online. We just eliminate that entirely by not carrying products that we don’t like. Steve: Yeah, that makes sense. I was actually shopping for some stuff on your site just kind of comparing on Amazon. And as you mentioned earlier, there’s a lot of stuff that looks very similar but because it’s not really branded, it’s really easy to get things confused. So, how do you make your stuff kind of stand out among your competitors? Allen: That’s a good question. I suppose we make it stand out because we’re offering more information. So, we have better product photos and we actually have a studio here where we take our own product photos, we have videos for most of the products that are on our website. Whereas if you’re looking on Amazon, or some of our competitors, they don’t have any videos at all. We have product descriptions that share all the details. So, we tell them exactly what is this case made out of on this hidden camera. So for example, there’s a really popular generic, it’s the type of product that’s just a free for all on Alibaba. You can source it from a million different suppliers. But the thing is, I’ve been selling that product for like eight years, and I’ve seen all the different iterations of this product. It might be in a plastic enclosure, but somebody else is selling it in an aluminum enclosure. The aluminum one feels much more higher quality than the plastic one, there’s some weight to it, it feels higher quality. But then you also have the internal components. So I might be offering a camera that’s 10 ADP, and it’s higher priced than the one that you see on Amazon, even though they look the exact same. But what that Amazon seller isn’t saying is that the camera side is actually like four ADP or 7 ADP. So even though the stuff looks the same, it really kind of is different. And we get customers all the time that call us asking why our price is higher or asking what the difference is. And that’s another value proposition we have is that we actually have a phone number where you can call and we’re happy to answer questions and match you with the right product. Steve: Interesting, so you actually provide tech support on all of the products that you sell? Allen: Right. So we offer expert advice. So if you haven’t bought anything from us, and you’re looking around, you’re trying to figure stuff out because people aren’t just buying this stuff like just because, they’re buying it because they have a need for it. And so they have questions, they have a lot of concerns, they’re trying to be discreet a lot of time, and so we’ll offer that up front advice and then we do lifetime tech support on all the products that we sell. We just do that on our own; we don’t have another company that does that for us. Steve: Would you say then that you close a lot of your sales over the phone in person as opposed to just on the website? Allen: Yeah, we did a test on it earlier this year. I’d love to find a way to make this like an ongoing test like we do it every month, but it’s really kind of annoying to run this test, but maybe 15 to 20% of the sales that we get are orders placed over the phone. Steve: Wow. Okay. I guess that makes sense. So that implies then that the people that are answering phones at your company, they have to be very knowledgeable about the products. Allen: Right. Yeah, we currently have four people doing sales and tech support, they do it all and we educate them on all the products that we sell. So we have everything in stock that we actually show them how to do everything. We have internal videos that we use for training. My most senior tech support person is actually the guy that trained me when I started at the spy shop here in Dallas like 10 years ago. Allen: He’s the guy that actually taught me all of the stuff that I know. And then when I went on to start my own business, maybe like a year later, I needed help. And I thought it was going to be so hard training my first employee, I just reached out to him and asked if he wanted to come work with me. And he said, yeah, so that was really nice. And he handles a lot of the training for my new employees. Steve: Okay, that’s pretty sweet. So, was he still working at the Dallas shop at the time? Allen: No, this is where it gets a little confusing. I worked at that store for about two years. And then five years ago, I started my own company. But there was a gap in there about three years. So like 2009, 2011, I was working in a brick and mortar spy shop for somebody else. And then in 2011, I actually got hired by a really bad TV show called cheaters. Steve: Yeah, I actually vaguely remember that. Allen: Okay. Yeah, they were a customer of mine and I was friends with the detective on the show. And the guy that created the TV show wanted to start his own brick and mortar spy shop. Long story short, I met with them, I convinced them to do an e-commerce website because I felt like that was the direction things were going in. And so they hired me to start an online spy shop for them, which they advertised in all of their TV show. They actually had like a 15 second commercial that ran in the TV show. And so when I went to work for them, I actually took the guy that trained me, my friend Vince, we went over to that venture. We worked there for about three years and then I went to start my own thing. And then a year after I started Spuy Guy, I needed help. And so he was still working over there and I convinced him to come and work for me. Steve: Interesting. So is that store still alive, the cheaters one? Allen: No, that one died a couple of years ago. It was a big mess, and I’d be happy to talk about it with you in case you’re curious. I’m not sure you want to air it because the guy is very litigious. Steve: Oh, that’s cool. Yeah, we’ll talk about it after after the recording. So, when I was going shopping for this, it was actually quite confusing, because there’s just so many different options and whatnot. And so one, like how do you get traffic to your store? And then how do you manage to close the sale once you do get someone there? Allen: So when I started out, I realized that SEO was going to take absolutely forever, it was gonna be really hard because my niche is pretty competitive. So I learned paid ads, I learned how to do Google AdWords. I probably bought like three different books on the subject, a lot of YouTube videos. I don’t know if it’s still around but there was a really good blog called PPC Hero that talks about. Steve: Yeah, it’s still there. Steve: Yeah, I know them [overlapping 00:16:56]. Steve: They’re big out here in California. Yeah. Allen: Yeah, he was managing their ad account in addition to a bunch of other ones, and he needed help. And I was like, all right, this sounds like a really good opportunity to learn PPC. And so I went to work with him for — I was only there like two or three months but I learned a lot about managing PPC campaigns. And that’s how I really scaled my business when I first started it, and it’s still a huge percentage of our sales today. Steve: So when you say Google ads, are you talking about AdWords or Shopping, display ads? Allen: Oh, yeah, so AdWords and then product listing ads, PLA it used to be called, I guess it’s just Google Shopping now. Yeah, so those two things. We tried the display thing, can’t really get it to stick. Steve: That’s been my problem too although I just had someone who’s an expert on that on the podcast. I just haven’t gotten around to implementing what she’s taught yet, so I’ll do it. Okay so AdWords, were you running these ads by yourself first and not being successful until you took on this apprenticeship? Allen: So my company launched in May and then I took the apprenticeship on in June. So just like a month later. I had been running my own campaigns for a month, and it was working, but it wasn’t enough to pay all the bills. And so the PPC apprenticeship was a good opportunity to earn a little extra cash. Not a whole lot, I was only getting like $1,000 a month, but it certainly helped and I learned a lot of info and I’m really glad I did it. Steve: What were some of your key takeaways that you learned from the apprenticeship that you were not doing actually before you joined? Steve: So the AdWords interface isn’t good enough to tell what’s going on, because you can actually do a whole bunch of filters and everything now within the AdWords interface. Allen: Oh, it’s been a while since I’ve looked at it. I ran my ads for probably eight months. And then I met somebody at the very first Ecommerce Fuel event in Austin, his name is Travis. Allen: Yep. He’s been doing all of my PPC for the last several years. And so I haven’t been in the weeds in quite a while. Steve: Okay, fair enough. So AdWords is like, or Google Ads I should say is a decent sized chunk of your revenue. What are some other ways that you’ve been able to get traffic to your site aside from that? Allen: We do get organic traffic, not a whole lot; it’s like less than 10% of our overall sales. And something that I just been really neglecting for years even though I know a lot about SEO, I’ve been neglecting it because I largely just got complacent with my business. And I hadn’t set new goals. Money was my main motivator for a really long time. But once I was making a sizable amount of money per month on my e-commerce website, I just kind of like fell into a phone for like a one to two year period where I didn’t have to do anything all day and I was still making good profit. So, I just kind of like didn’t do anything. And now I’m paying the price for it because I got Google like suspending my account for like weeks at a time because they don’t like what I’m selling. Steve: Did you say Google suspending your account. Is that just for PLAs or just in general for AdWords as well? Allen: Yeah, it was for Shopping. Steve: They’ve been cracking down a lot of industries actually for that recently. Allen: Yeah, I’ve been looking at that and when they do that, it’s so difficult because you have no idea what to do. It’s like all of a sudden, like your sales drop like a rock. And you can’t get ahold of anybody there. They won’t let you actually talk to the policy team directly. You have to go through and just some phone support person that’s totally unhelpful. And so you can’t find out exactly what’s going on. They’re not clear and their description of what problem they have with your ad or website or whatever. So it’s very frustrating to just suddenly wake up one morning and then see no sales coming from Google Shopping, and then you realize they shut down your account without telling you, and it takes like or two weeks to get it running. It’s beyond frustrating. Would you say then that a lot of your sales are just like word of mouth sales? I would imagine like once someone trusts your store, and because the whole industry is kind of sketchy, then I can imagine word of mouth being a huge factor. Allen: It is. Yeah, especially after we started getting reviews on our website and stuff, getting reviews on the website really helps because it convinced people who are shopping to do business with us, and then I feel like I run a pretty good business. And so, they would order from us, they’d be satisfied and then maybe they have a friend of theirs that’s going through some issue, and it’s just a word of mouth referral. And so, we do get a lot of direct traffic. Actually, I’m glad you brought that up because we do get a lot of people that just are coming directly by typing Spuy Guy into the URL I’ve noticed. Steve: How did you get your press mentions? Like I know in the beginning, you’ve been on CNBC, Entrepreneur, Forbes, Fast Company. Did you go out and try to get those? Do you have a PR person or did those just kind of fall in your lap? Allen: So it all started when I got mentioned in Forbes and I’ll tell the story about how I got involved if you like. Allen: I’m a huge Tim Ferriss fan. So like 4-Hour Workweek was a huge influence on me years ago and one of the resources that he talks about in there is Haro, helpful a reporter out. And basically three times a day I get an email with reporters, bloggers, journalists, whatever you want to call them. They’re looking for sources for their stories. There’s another one that’s out there, it’s called PR Newswire or something like — I can’t remember off the top of my head. Profnet I think is what it’s called. But it’s a very similar service, a little bit higher quality, but it also costs a lot of money. And so I was using those two services to find people who were asking questions about things that I knew about. It might be digital marketing, it might be entrepreneurship, sometimes they talk about spy related stuff I guess or security related issues. So I try to be as helpful as I can in those emails, so that they can quote me in an article. And one day I open up [Inaudible 00:25:08] and I see a request in there in the business section and it’s like looking for million dollars solopreneurs. And I was like, oh wow, nobody’s going to respond to this because there’s probably not a whole lot of people that are running a business by themselves and doing a million dollars in revenue. And I noticed that it’s a Forbes next to it. I’m like, I have to respond to this. I have to do the best answer I can in this email so that maybe they’ll reach out for a phone conversation and I can get quoted in Forbes and so it worked essentially. Steve: I’ve never had any good luck with Haro actually. Allen: It’s been awful lately, like the last two years I haven’t gotten like anything. Fortunately, that Forbes mention — so this is a little tricky, I made sure to name drop Tim Ferriss a lot and the interview that I do with Forbes so that if you got mentioned in it, then I could like send it to him, and then he’d post it and share it with his audience. And long story short, that worked. Allen: That Forbes article went live, three days later it hadn’t had any clicks or anything like that. But they made Tim Ferriss like front and center on the article. They had an image of him that’s like the banner image. And so what I did was I set my phone, I installed Twitter on my phone, and I had set up to text me or whatever, whenever Tim Ferriss was posting on Twitter. And this was back when he wasn’t doing the podcast I think, so most of his tweets were authentic and he’s like typing it on there and asking questions of his audience and whatnot. And so whenever it was an authentic post, I would send a link to the Forbes article saying that it mentioned him. It only took me like two tries, but then he retweeted it to his audience. He sent it out in his five bullet Friday, posted on Facebook, and then all of a sudden it went from like 1,000 views over three days to like 300,000 views in like June period or whatever. And so I think like Inc.com, they spun the article or whatever. So it was just a rehash of the original Forbes article. And then when I do other help a reporter out responses, I like be sure to say, hey look, I was mentioned on CNBC and Forbes, and I’ll link to those articles and stuff. So it gives me credibility with whoever is seeing that response and then they are more confident in featuring me. Steve: That’s a very good strategy and that apparently works, yeah I can see how that would work. Allen: Yeah. Another really great resource if you’re looking for PR is Ryan Holiday’s book, Trust me, I’m lying. I found it fascinating. And I’ve actually used a lot of the tactics and strategies that are in there to get press mentions. Steve: Why don’t you just name one for people who haven’t read the book? Allen: Oh, okay let me think about it. Steve: Okay, we can come back to it. Steve: All right. So I would also imagine you mentioned earlier that you have businesses that buy from you, right? What is your strategy there on getting these b2b customers? Allen: I guess it’s b2b, I never really considered it. We do have customers that are business owners, and they’re trying to combat employee theft. We have police departments and private investigators that are purchasing equipment from us. And I don’t really have a strategy there, they just find me. Maybe they’re looking for what I sell, and they’re doing some comparison shopping or whatever. And then they see our website, they see the phone number, and they call and ask us questions and whatnot. Steve: Okay, so you don’t go through your customer list to see if anyone looks like they could be like a large customer? Allen: We do. So, whenever we see a customer place an order and it says like private investigator or PI, or investigative services, or whatever, they have their business name and the title, we’ll make a note of it and realize that this is a customer that, okay, these types of customers and this police department, we can probably get multiple orders from them. Whereas with regular customers, they’re pretty much one and done. So, lifetime value for my customer is whatever they place on the first order. Steve: Right. Yeah, that’s kind of what I was getting at. So just kind of curious what your strategy has been, because a lot of these people are one and done. Do you get a lot of repeat business in general? Allen: No, not at all. Allen: It’s brutal. Yeah, if I can do it all over again. Steve: See, you get a steady flow of customers, obviously. And so they’re just funding you have through search. Allen: They’re finding us through search primarily, Google Shopping and AdWords. That makes up the majority of the traffic that we’re getting. We’ve played with Facebook, it’s so difficult to target people that need spy equipment. Like there’s no demographic in particular. I’ve looked at all this stuff on Google Analytics, they break it into four different age groups or whatever. And it shows you the percentage of people that are coming to your website and what age group they are in like 25, 25, 25, 25, male, female, slightly more female than male, which is shocking. Steve: That’s interesting actually. Okay. Allen: Yeah. So more male visitors, but more females convert. It’s weird. I loved another reason behind that. But there’s no common interest or trade or demographic or whatever you want to call it that a customer would need, a shopper would need to become a customer of ours. Steve: I’m not sure how I would feel if I saw spy equipment ad in my feed too, like, as we talked about earlier, right? Like if my wife was just browsing my Facebook or using my computer and all of a sudden she saw like hidden camera stuff, she’d probably ask me about it. Allen: Right. We haven’t had any luck with product ads or anything like that on Facebook, we’ve tried the retargeting thing. It’s just breaking even really. And I’ve had multiple people, not just my account manager, but I’ve had multiple people that do Facebook ads for living, look at my account and be like, oh, yeah, this is really difficult. Okay, I have some ideas for new strategies for Facebook. It just takes up a lot of like we need more ad creative and we need to make use of more videos and more content on our website. And just content production is expensive, it takes a long time. I think that we’re starting to figure out a strategy that might work with Facebook. Steve: Okay, what is your email strategy? I actually didn’t notice any pop ups and offers when I landed on your site. So, I was just curious. Allen: Yeah, I don’t have one. So, I mentioned earlier I went and started cheater spy shop, and I was there for like three years. And we did email marketing when we’re there and I know from that experience, we just weren’t making any money on it whatsoever. Why? Allen: There’s probably several reasons why, we don’t really get new products. There’s not a whole lot of people that are developing spy equipment at all. So, it’s largely the same stuff that’s been selling for a long amount of time and customers are not repeat purchasers. So, if they order something on the website, we get the email and we try to hit them up for more sales, it’s pretty much a no go there. I do think that we — I know for a fact we can make email a lot better than it currently is because we’re only sending a couple emails a year like Cyber Monday, Black Friday, we do a little bit of Valentine’s Day related stuff. Steve: Valentine’s Day, hilarious. Okay. Allen: Yeah. Well, so here’s how it goes is that if somebody is like having an affair or whatever, they’re going to have to celebrate Valentine’s Day twice, so one with their spouse and then the second person is on the side, and so they usually do that like on February 13 or whatever. And so what we’ll do an email series in the lead up to Valentine’s Day to be like, hey, this is a perfect time to catch an affair if you’ve been suspecting. Allen: Yeah. But you’re right, I don’t have a pop up on the website, been looking around. I heard you’re Privy thing on the podcast recently, so I’m taking a look at it because I do know that we have a lot of customers that are people visiting our website that don’t buy the first time that they visit or the second time that they visit, and we really do need to be emailing them. It’s something that has been on my radar and I just haven’t gotten around to it for several reasons I guess. Steve: I actually went ahead and did a bunch of shopping before this. I just looked around and I can say that I think what’s very attractive at your store and it’s probably why it’s so successful is the fact that you curate the products and then you explain them and you provide tech support, which is something that you’re not going to get at all on Amazon and these other sites. They are kind of sketchy too. And the fact that you’re willing to put your face in a video also really adds a lot to the credibility of the site. Allen: Yeah. So I’ll tackle the last one first. Here is the thing, I hate being on camera, I’m just always hated it. I feel like, I look goofy. And more importantly, I just didn’t want to be associated with spy equipment at all. I was really hesitant to put my face on the website, because I don’t want this to be what I’m known for. This is just [overlapping 00:34:27] right. I’d rather be, I’d be happy to put my face on something if I was like, really super, if this was a product or industry where it’s very shareable. Right? Nobody is sharing spy stuff on Facebook and Instagram and whatnot. If I could be in a different industry, like selling music equipment, or if I were like a really hot model and I was selling like, bikinis or whatever, I’d be happy to put my face out there. But I didn’t grow up wanting to be associated with spy gear or anything like that. And so for the first like two years that I did my company, my face wasn’t anywhere on there because I didn’t want people know that this is what I was doing. But I’ve just learned to embrace the fact that I’m in a really weird industry with a lot of people that are genuine and need help, and nobody out there is filling that need. And so I kind of put myself out there, I was like, hey, look, I’m the guy that you can trust. I have everything in stock. I’m not drop shipping everything, you can actually call us and ask questions and we’re happy to help you out. And that was radically different than what everybody else was offering when I hit the scene. Steve: I think that works really well. Like as I was shopping, the video that you put out, it just looks — it was, the lighting and everything was great, but it was just very authentic. I think that’s the right word. And it made me want to trust you because you’re not like the sleazy guy trying to hawk spy equipment. Allen: Right. Yeah, I don’t. I don’t think of myself as sleazy. I’m just trying to be an honest guy matching a product to a customer that really needs it, because some of these customers are going through like really frustrating situations. And not to bring the mood down or anything like that, but they might have a parent that’s in an Alzheimer home and they think they’re getting abused. So they want a hidden camera. Or maybe they have a kid who’s autistic and they think that something is going on and they’ll like put a recorder in the backpack and then find out that the teacher is like verbally harassing this kid, or they’re being harassed like a woman might be harassed at work, and she needs to prove it. And so, they’re going through these situations, they’re going through divorces, it’s all really sad. And a lot of times, they they call us and they want to unload on us because it’s so frustrating for them. Unfortunately, we’re not licensed therapists or anything like that. And so we listen to their story, we try to match them with the best product that will help get rid of that issue that’s causing them some sort of emotional or financial distress. And so, by putting ourselves out there is like, hey look, we’re here to help you out. We’re not just trying to make a quick buck selling a crappy product, we really only sell the best stuff. I think you’re right. I think it does shine through. Steve: I think so for sure especially among the stores that I was looking at comparing them to yours, actually. Allen: Yeah. And one more thing I’ll mention about it is that we get so many people that call here and like straight up asked for me, or like maybe I’ll have an employee that’s sick or maybe I’m at the office and my employee’s phone rings for a sales call. And I’m like, hey, you know what, I want to take that call. I just kind of want to keep my finger on the pulse of the business. And so I’ll do the sales call. And I’ll say, hey, my name is Allen, thanks for calling. How can I help? And they’ll be like, oh, you’re the guy in the video because they recognize my voice. Allen: Right in the video. And I’m like, yeah, and they’re like, oh, that’s awesome. Why am I talking to you? And I’m like, well, I own the business and sometimes I answer the phones just to find out what’s going on and talk to customers because I like it. And so they like that and then I’ll take an order over the phone. Steve: Nice. So I know recently you’ve done some adjustments to your website, you did a redesign, I want to ask you, what are some of the key takeaways that you had from just kind of changing things around this past year? Like what are some of the mistakes that you tried to address, and and what did you try to emphasize about your store? Allen: Yeah, so when I started my website like four and a half years ago, I used a default Shopify theme. The guys over at out of the sandbox, they are a development company that specializes in Shopify themes, they make really good themes. And so, I went ahead and bought one for like 150 bucks at the time I think that was good enough, and then I got into an argument on Reddit with some guy about logos and how they didn’t really matter all this other stuff. And I ended up hiring him to design a logo for me, it’s kind of funny. Allen: So, we made the website, it was very scrappy. I got the whole company started including like forming the LLC and all the legal stuff for under a grand. And so it was very bootstrapped effort. And we had the same website largely for like the next three and a half years where I just didn’t change anything at all. And then it finally got to the point where I was going to conferences, I was meeting people like you, I was meeting a lot of people who took a lot of pride in their businesses whereas when I looked at my business at the time, I was like, I could be doing a lot better, I could have a much better website and plus it’s how I make like 100% of my income. I really need to up the design of the website. And so I had found somebody that was I thought did amazing work designing websites, I found another person that I thought did amazing work with branding, and so I worked with those two people to come up with the website that I have now. I kind of have a funny story your listeners might enjoy. I had the logo when I started this back in 2014, and it was just like this sketchy looking detective logo or whatever. It was a guy in a fedora. And a year later, I noticed that an extremely similar logo was being used for the Google incognito like the Google Chrome. Steve: Yeah, incognito mode. Yeah. Allen: Yeah. So they’ve had three different incognito logos since they launched Chrome. And the first one was like a dude in a trench coat. It looked really super scary looking. And then after my website was live for like a year, they changed the logo and it looks almost exactly like the logo that I had created a year prior. And then they modified it again like a couple of years later, and then it was even closer to my logo. And so I had a lot of customers that were like you just stole the Google incognito logo and put it on your website. And I’m like, no, I swear I was first. And it got to the point where I was like I got the sketchy looking detective dude as my logo. My color scheme is black and white. I could probably redo this to make it a little bit more trustworthy. And so that’s why I went through the whole brand redesign process. Steve: Like your numbers were fine at the time, right before you did the design. Allen: Oh, yeah, they were great. We were really hesitant to change anything at all. Again, like, for the first several years of the business, I was just interested in running a four hour workweek style business that was very hands off, and I achieved that goal. But eventually I was like, you know what, I really want to scale this thing to be bigger than it was before. I want to be proud of my website and my brand. I’ve got my face on this whole thing, it should really be the best thing that it can be. It’s time to put some money into this website. And my marketing guy was very — he was like, dude, I don’t know, this is working really well. You don’t want to suddenly have a huge drop in sales. We know this thing converts. And so, I was like, yeah, we can always go back to it. It was an experiment, I learned a lot and I’m glad we did it. Steve: What were some of your key takeaways from the whole experience? Allen: Key takeaways. I would not work with two people again. When you’re small e-commerce business like I am, you should not have a whole bunch of projects going on at once, because everything moves slower. It becomes very difficult moving from one task to another. So I was looking at manufacturing my own products. I was looking at redoing the website, I was looking at filming new videos, I was looking at all sorts of different aspects of my business and putting on different hats and stuff was very frustrating. So going back, I would have just made the new website like my only priority for like the next six months because it was very intensive. It was hard to go between all of these different projects, it’s just too much of your brain ram being taken up. And then also working with two different people that were not communicating with each other was so difficult. Steve: Who were these two people? You had a designer and someone else or? Allen: Yeah it was very frustrating. Steve: Well, all that’s behind you. So Allen, looking forward, what are some of your plans and hopefully people don’t need spy equipment but where can they find you online if they need something, and will they get you on the phone actually if they do call? Allen: Yeah, sometimes they’ll get me on the phone. The website is SpuyGuy.com. It used to be Spy Guy Security but I bought SpyGuy.com about a year ago which is like a whole another interesting story about negotiating a domain and stuff. Steve: [Overlapping 00:44:40] what was your rationale for doing that if you already had Spuy Guy Security for so long? Allen: Spuy Guy Security, I think it’s like 14 letter domain or whatever. Spyguy.com, it’s just six. It sounds like a Silicon Valley startup. Like it’s just very straightforward. It rhymes. It’s catchy, it’s memorable. We have a logo to go along with it. So it’s very memorable. Spy Guy Security is a lot more, I don’t know. It sounds more professional I guess you could say. But I think that the succinctness of SpyGuy.com, it’s kind of like an intangible thing I guess you could say. It’s very, yeah, I don’t know, I haven’t been thinking a lot of that. Steve: Fair enough, man. All right, so SpyGuy.com. And if you need spy equipment, feel free to hit him up. And yeah, if you guys can’t tell from this interview, Allen is a very genuine guy. He just tells it like how it is, and he’ll help you out. So Allen, thanks a lot for coming on the show, man. Allen: Yeah. Thanks for having me. It’s been fun. Hope you enjoyed that episode. Now, what I like about Allen is that he’s just a regular dude, and he’s a complete open book. And it’s always refreshing to hear a realistic account of all the ups and downs of entrepreneurship. For more information about this episode, go to mywifequitherjob.com/episode242. And once again, I want to thank Privy for sponsoring this episode. Privy is the email capture provider that I personally use to turn visitors into email subscribers. They offer email capture, exit intent, and site targeting tools to make it super simple as well. And I like Privy because it’s so powerful and you can basically trigger custom pop-ups for any primer that is closely tied to your ecommerce store. If you want to give it a try, it is free. So, head on over to Privy.com/Steve, once again, that’s P-R-I-V-Y.com/Steve. I also want to thank Klaviyo which is my email marketing platform of choice for ecommerce merchants. You can easily put together automated flows like an abandoned cart sequence, a post-purchase flow, a win-back campaign, basically all these sequences that will make you money on autopilot. Right now they have this cool docu series called Beyond Black Friday that I highly recommend that you check out and that can be found over at Klaviyo.com/beyondbf, once again that’s K-L-A-V-I-Y-O.com/beyondbf.